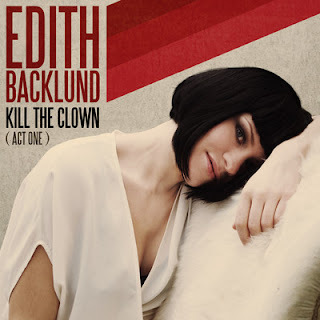 Edith Backlund, Swedish artist who's made debut back in 2005 and has managed to release already two albums, second of which was produced by The Wannadies frontman Pär Wiksten, can become a new face for you but hopefully from now on she's on the way to get into the spotlight of Swedish pop fans working on a fresh stuff with Peter Kvint who worked with a long list of Swedish and foreign artists like Andreas Johnson, the Ark, Nick Carter, Sertab, Jill Johnson, Orup, Alice Svensson. Earlier this year Edith has presented "What I've Become" - dark melancholic acoustic ballad with Melissa Horn-smelling light vibratto and in November she's ready to digitally release first part of her upcoming album "Kill The Clown". Though it contains only three tracks currently we get another single "Dance In Circles" - beautiful dramatic but light pop-rock song that we would probably compare with atmosphere of Eskobar albums (Peter worked with them also), relaxed Edith's vocal and lovely building melody finalize the whole pack. Another great tune of EP is "Black Hole" that is closer to "Dance In Circles" rather than "What I've Become" and is exactly that side of Edith we fall for more.